Are you living out the Declaration of Independence? Not in theory or ideals, but in practice! I’ve been carrying around a small copy of this historic document for months. I received it as a gift while attending Book Expo America in New York City back in June. The burgundy, pocket-sized book with gold lettering never left my person — or my purview. I’m all about pursuing happiness but hadn’t realized that the document upon which the United States government was founded extolled such virtues for a new kind of people. Happiness and government? Together? Apparently, this novel idea birthed in the 18th century was now yearning for a 21st century echo. The Declaration of Independence was prompting a call not only to U.S. citizens but to any freedom-minded individual around the globe. Would we consider the words anew and contemplate our extension of them into a human reality? Such thoughts inspired the following podcast entitled, “Are You the Embodiment of the Declaration of Independence?” Consider just how much you embody the spirit of that historic declaration designed to change the course of world government and the future of society for mankind. Click here or on the podcast cover below to listen in. According to the Declaration of Independence, we’ve all been endowed by our Creator with the unalienable right to pursue Life, Liberty and Happiness. I hope you take advantage of claiming your personal independence by making these virtues a reality in your life. As you do, these virtues can shine anew for others, too! From the U.S. Capitol – Where is Your Center of Influence? 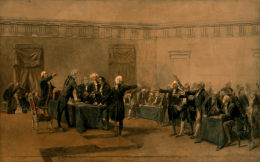 From the New Jersey State House – Are You Part of the General Assembly? No matter who you are or where you live, I hope you demonstrate the advancement of humankind. Declare your own independence as you embody the values of Life, Liberty and the Pursuit of Happiness!